Moving from legacy to cloud infrastructure is a huge win for business, but the process requires a fundamental shift in organizational culture and business processes both inside and outside IT. 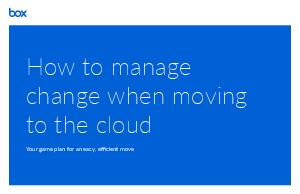 In fact, managing this change may be the biggest challenge your company faces when moving to the cloud, unless you're equipped with the resources that make for a simple, successful transition. Here's our tried-and-true 3-step approach proving that change doesn't have to be hard. Download now to start your easy, secure and efficient move to the cloud.